A Grant County trout stream has given up the tooth of a mastodon. 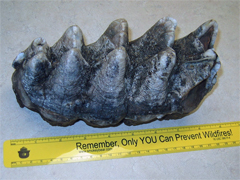 The eight and a-half inch long prehistoric tooth was discovered earlier this month by a DNR heavy equipment operator. The DNR stopped work on a trout recovery project when the tooth was found, but resumed work after being cleared to do so by Wisconsin Historical Society archeologist Sherman Banker. "If someone took the time to go look, they might come up with more, but then again it&apos;s a juvenile tooth, to you might not find anything," says Banker. "When we got there, it was evident it had come down slope from a high energy event." And minus that context, Banker says the find, while interesting, is still just a tooth. Banker concluded that the find was not significant. No other bones or other artifacts were found near the tooth that might have shed more information on the animal.